Still learning, but I’ve been getting a little better with shading and using negative space for highlights. I like how the feathers in the back pop. I’ve been thinking of experimenting with adding color to some of my sketches, but I’m afraid to ruin it after I like the pencil drawing. great work Stuart! I would suggest do not go much into details now, you are capturing the shapes very well, so do not mind details for now. Regarding the coloring. 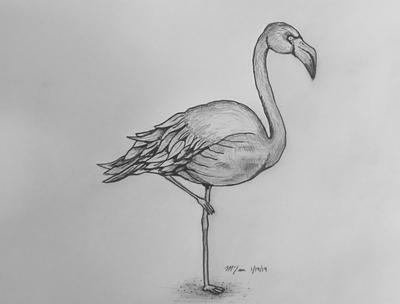 You can sketch (only roughly sketch) on a separate paper or on the side of the same paper your flamingo's clone without going much into details, just the basic outline. Or, simply trace it and you can practice coloring on that second sketch.